In the winter I had mentioned to my friend Topher that I was starting this hobby and he immediately told me that his wife Barbara had lost her wedding ring in their garden a few years ago. They had rented a detector, but did not find it. 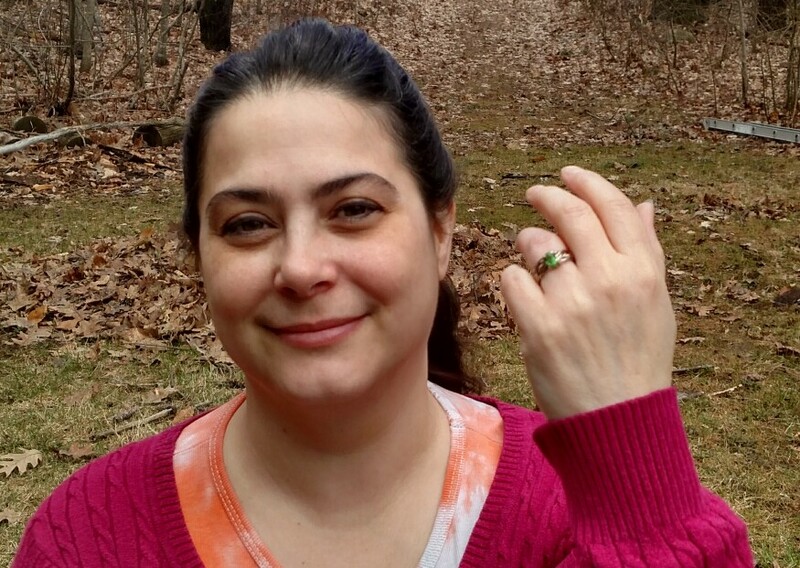 A week after my first exciting find I went over to their home to have a look. 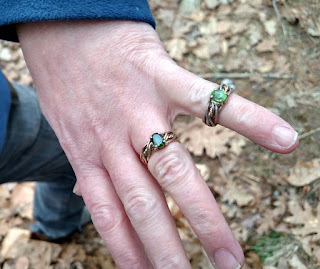 I asked Topher to show me his nearly identical wedding ring, a beautiful hand braided mixed color gold with a green tsavorite (garnet) stone. I took a reading with my ACE 300 detector that came up as 42 to 43. So I set the custom discrimination to the 3 bars that span about 35-60. This would simplify the search because I would only hear "dings" for items like his ring. Barbara explained that she thought that she had lost it while hanging clothes and it may have fallen out of a hole in her pocket. So I walked the path to the clothesline sweeping the detector wide with Topher watching carefully and asking questions. 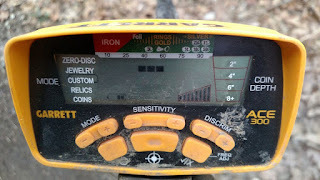 It was over 100 feet with no bleeps, and nothing under the clothes line. At this point I was thinking that this would be a long hunt. Then I noticed their top bar bee hive nearby and started circling it. "Ding-ding" - I got a solid signal and homed in on it with my GP pointer and dug up a small 10mm brass circle with some tabs on it that looked like a clothing decoration. Neat! Then recalling the admonition to “check all holes” I took another swing over it. Another good signal just off to the side of the hole and I brushed a few leaves aside and there was the ring right on the surface! Topher saw it first. 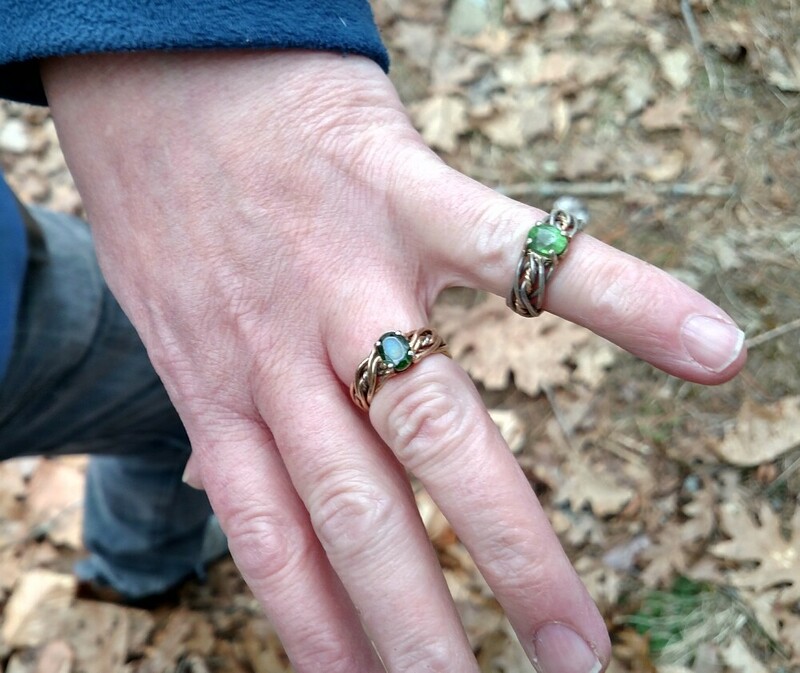 Here are both rings on his hand right after we found it. And a very happy Barbara! Total hunt time was less than 10 minutes, talk about lucky. Of course they were both thrilled. To be honest I was a tad disappointed because it was so easy. But they have invited me back to hunt some old home sites on their property where they have found tons of ceramic and glass. I'm definitely going back! 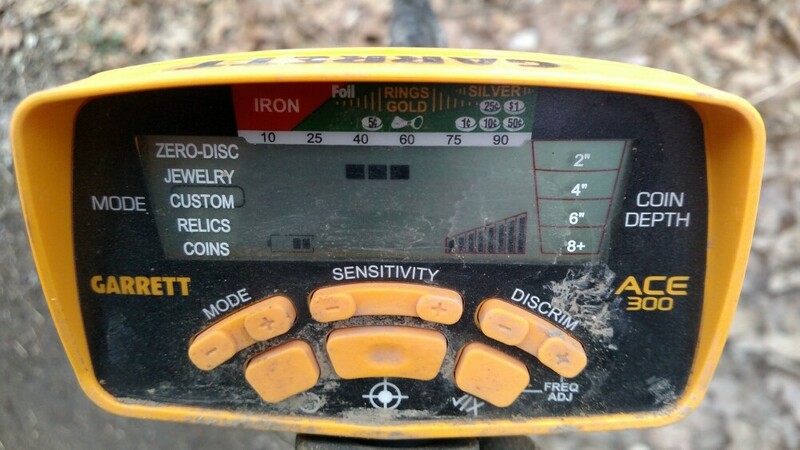 Shortly after I posted this great find to a detectorist group on Facebook the editor of Treasure Hunting Magazine contacted me to ask if I would be interested in writing up the story for them. Of course I would! 😄 The article came out in the August 2018 issue (page15).